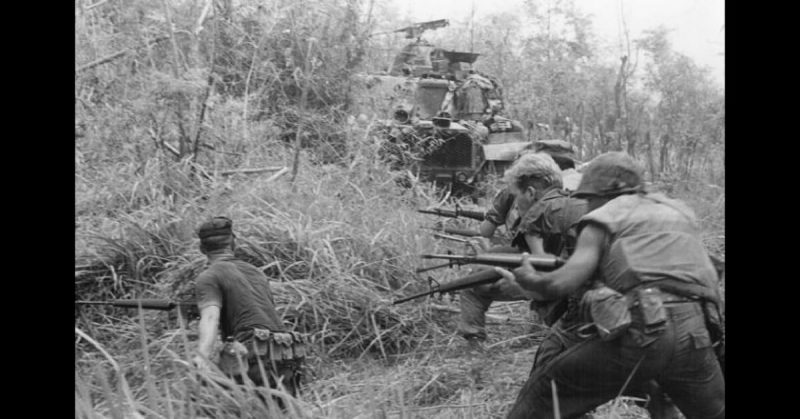 US Marines in Vietnam during Operation Allen Brook in 1968. He earned three nominations for a Medal of Honor but received only one. Not because he did not deserve all three, but because some of his actions occurred where officially the US Army was not supposed to be. Robert Lewis “Bob” Howard was born on July 11, 1939, in Opelika, Alabama with a family reputation to maintain. His father and four uncles all served in WWII. Sadly, two died during the war, while his father and two others died of their wounds after it ended. With little money, the family was forced to move back in with his mother’s parents. To help put food on the table, Howard and his sister picked cotton at a very young age. In July 1956 when he was 17, he dropped out of school and joined the US Army. In Vietnam, Sergeant First Class Howard served with the Military Assistance Command, Vietnam–Studies and Observations Group (MACV-SOG). It was a highly classified organization carrying out secret operations throughout Vietnam and the surrounding territories. On November 16, 1967, the SOG attacked a North Vietnamese Army (NVA) cache. Howard had killed four soldiers when a machine gun nest opened fire on his team pinning them down. He shot a sniper and then charged the nest, killing its occupants. Another machine gun then began shooting at them. Robert L. Howard on March 2, 1971. He grabbed a grenade, crawled up to the nest, and destroyed it at point blank range. More firing forced him to retreat enabling another NVA force to retake the machine gun. Grabbing a light anti-tank weapon, he stood as bullets whizzed past, and fired – taking out the second machine gun for good before his team was extracted by helicopter. He had earned his first MoH recommendation. As the encounter had occurred in Laos and the US was a cosignatory of the 1962 “International Agreement on the Neutrality of Laos,” the operation never happened. Instead, the recommendation was downgraded to a Silver Star. On November 15, 1968, he accompanied a Forward Operation Base (FOB) 2 Hatchet Platoon; again into Laos. Four days later, they were ambushed by NVA troops with a Soviet Pt-76 tank. Using his trusty anti-tank rocket, and braving intense fire he crept toward the tank and destroyed it. 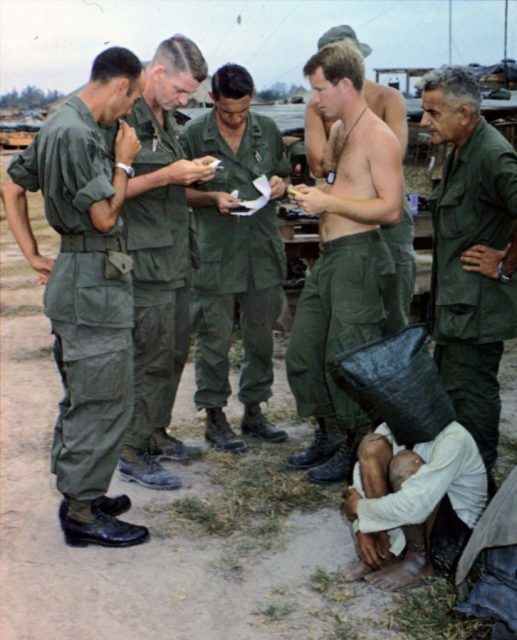 American soldiers with an alleged Viet Cong captive near the Cambodian border. When a medivac chopper came for them, it was shot down. While wounded, Howard ran through enemy fire to the helicopter, and lead the two surviving pilots and injured door gunner out. He then fought another 300 yards through NVA fire to get them all to safety. He sustained more injuries receiving 14 pieces of shrapnel, which really annoyed him. Pissed off, he charged the NVA, killed two, and took one prisoner. A rescue of the men was attempted but was unsuccessful as the NVA kept them at bay with anti-aircraft guns. Next morning when another attempt was made Howard charged forward and silenced a 37-mm anti-aircraft gun allowing the extraction to go ahead. A rescue of the men was attempted but was unsuccessful as the NVA kept them at bay with anti-aircraft guns. Next morning when another attempt was made Howard charged forward and silenced a 37-mm anti-aircraft gun allowing the extraction to go ahead. 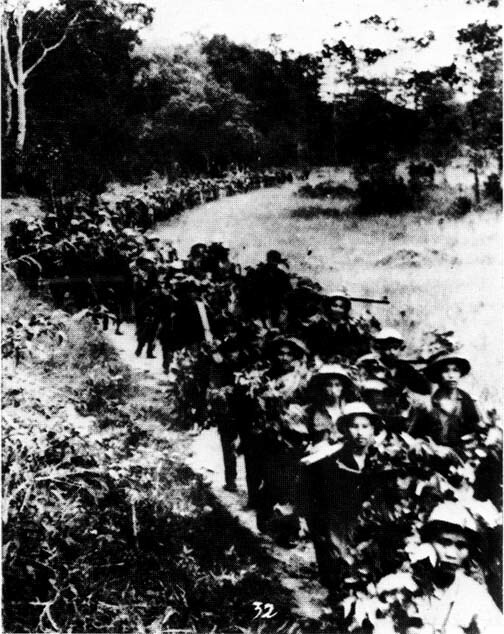 North Vietnamese Army troops marching through Laos in 1967. Again, he was recommended for a MoH. 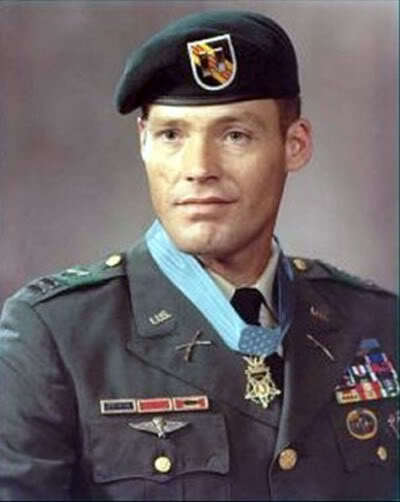 Again, as the operation took place in Laos, he got a Distinguished Service Cross, instead. On December 29, 1968, Private First Class Robert Francis Scherdin was the assistant team leader of a ten-man reconnaissance patrol. They were in Cambodia in the tri-border region of South Vietnam and Laos when they were attacked. Scherdin became separated from his team. Howard was part of a 40-man rescue team that flew in the next day. They were fired upon even before they landed. One Huey was shot down, so the platoon leader ordered Howard to secure the landing zone. As he led his men up a hill, he and Lieutenant Jim Jerson were injured by a landmine. A bullet then detonated the latter’s ammunition belt. When Howard came to, it was to blindness and pain. After several minutes, his vision returned, but the pain in his hands was intense as shrapnel had shredded them. 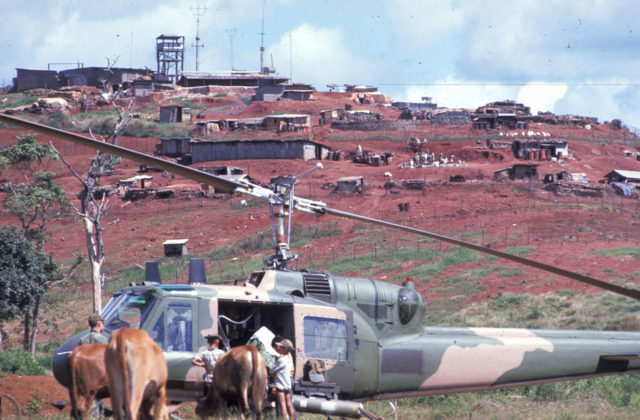 A US Air Force Bell UH-1P helicopter of the 20th Special Operations Squadron “Green Hornets” at a base in Laos in 1970. Screams of dying men reached him – some were burning. It was an NVA soldier with a flame thrower. Howard tried to drag Jerson downhill, but it was not easy; he was 6-feet 4-inches tall and weighed about 200 pounds. Two NVA companies were firing at them as Howard dragged Jerson to a log. NVA soldiers rushed them. One ran directly toward Howard, his bayonet raised but he tripped over Jerson. Howard was then shot in the foot. The situation was grim. They were surrounded so Howard did the only thing he could. He ordered the remaining 20 men to make a triangle with three strobe lights. Then he radioed base and ordered an airstrike on their position. For the next three and a half hours they held their ground until the strikes finally came. The explosions were so close some of his men were hit. An emergency night extraction then rescued them. Despite his severe wounds Howard refused to board until everyone else had. Unfortunately, Scherdin was never found. 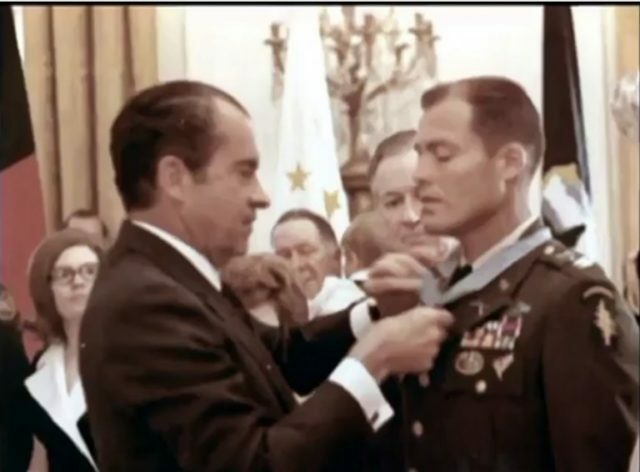 Howard finally received his MoH on March 2, 1971.